I’m not going to go into the boring technical explanation of how shallow depth of field is achieved, there are plenty of tutorials on the web showing you how it’s done. I will however link to a few at the bottom of the post if you’re keen to learn more. First of all, we all know that great equipment doesn’t make a great wedding photographer but when you’re looking to get incredibly shallow depth of field, it certainly helps. When it comes to achieving that dreamy background we all know and love, a small ‘point and shoot’ camera will never compare to professional full frame camera using a (very) wide aperture. I’ve got a few lenses that will actually make your eyes go blurry if I told you how much I paid for them. The out of focus background in photography parlance is called Bokeh. 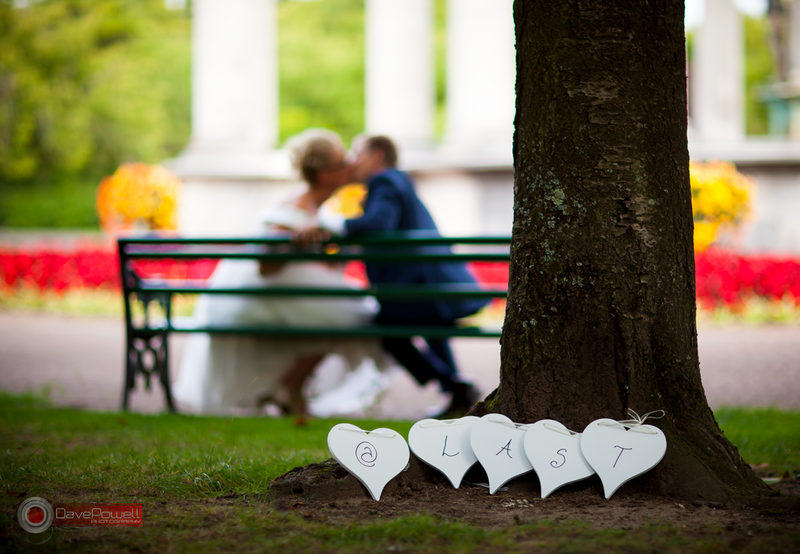 Pronounced boh–kay it’s the out of focus parts of the image and can look beautiful when used in wedding photography. The aim is to have the subject being the only object in the photograph in focus. This draws the viewer’s eyes into the important section of the photograph and almost gives it a 3D effect. Here are a few examples showing how I’ve used this technique in my wedding photography. Be sure to click on the photographs if you would like to see them a little larger. This image was taken at the bride’s house while she was having her hair and makeup done. 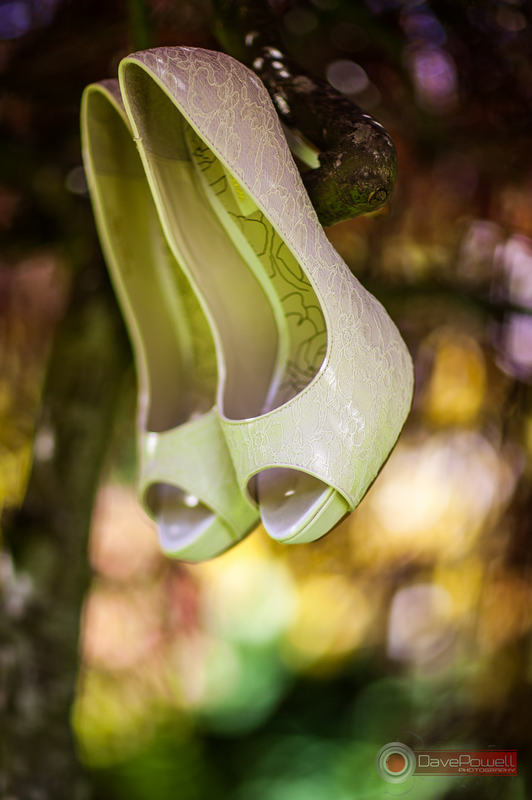 I took the shoes out into the garden and hung them from a small tree on the patio. Yes I did make sure the tree wasn’t going to mark the shoes before I did it. I used my absolute favourite 85mm f1.2 lens shooting at its maximum aperture. Shooting this ‘wide’ is very difficult as the focal plane is incredibly shallow. In other words the distance either side of the focal point is probably only a few millimetres. As you can see, the detail on the nearest shoe is shown but the far one starts to fade out of focus. The green leaves of the tree are only a few feet behind but they are so out of focus they’re almost impossible to make out. This next photograph demonstrates my absolute favourite use of this technique. I’m photographing a wedding in a large church and I’m stood just to the right of the alter. 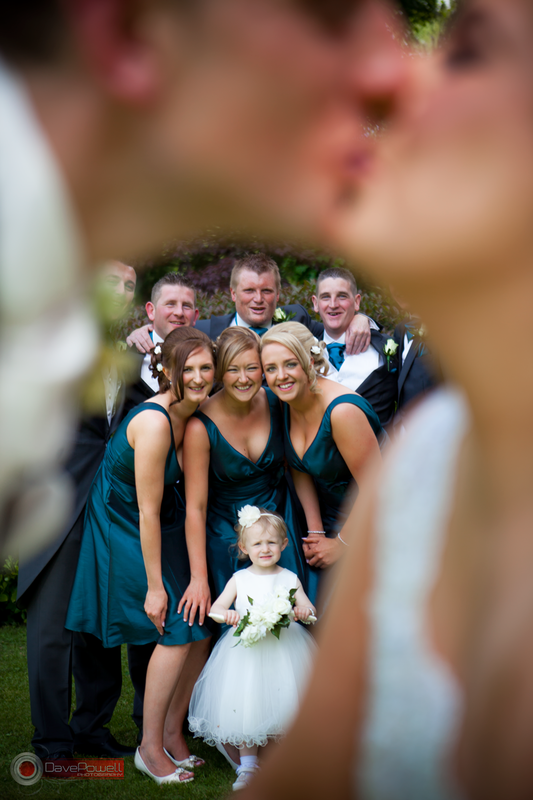 I’ve focussed my camera on Amelia, the bride, again using a very wide aperture. 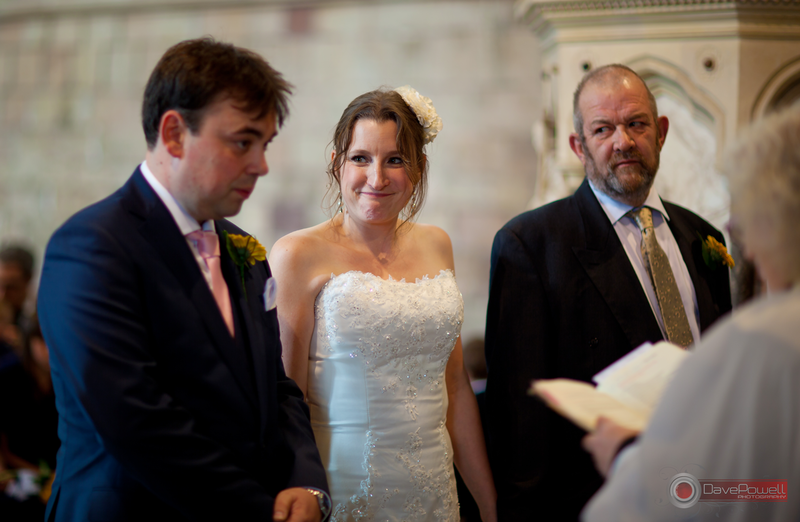 By using a shallow depth of field I’ve managed to draw attention to the bride. Even though the Groom Owen and Amelia’s father are stood very close to the bride, they almost become secondary to Amelia in the image. It seems to make the photograph more emotional by isolating the little glance that she is giving her husband to be. I also love the way that Amelia’s father is looking on with a little approving smile of his own. This photo shows that the subject in focus doesn’t have to be in the foreground. Sam and Edward got married in Cardiff after a long engagement and they asked me to take this photograph to give to all the people that nagged them to tie the knot sooner. It was taken in the grounds just behind Cardiff University. There was actually someone walking in the background as the park was very busy but because it is so out of focus it was an easy cloning job in Photoshop to edit them out. This photograph is a bridal portrait I took at Sara and Jonathan’s wedding a few years back. I used a longer lens this time, my 70-200 F2.8L. When you use this lens at the 200 end it gives an exceptional quality to portraits. Notice how Sara’s left eye is in focus but because she has her head tilted slightly away from the camera her right eye is slightly out of focus. Everything beyond this is starting to blur. By increasing the contract of the image and converting to black and white, Sara’s eyes really become striking. The next photograph shows where depth of field can be used for a bit of fun. This image pretends to be a serious portrait of the groom with the camera focusing on him but the bride is having none of it. Well, I suppose it is her day after all. I always make sure I have time for a few shots like this one. 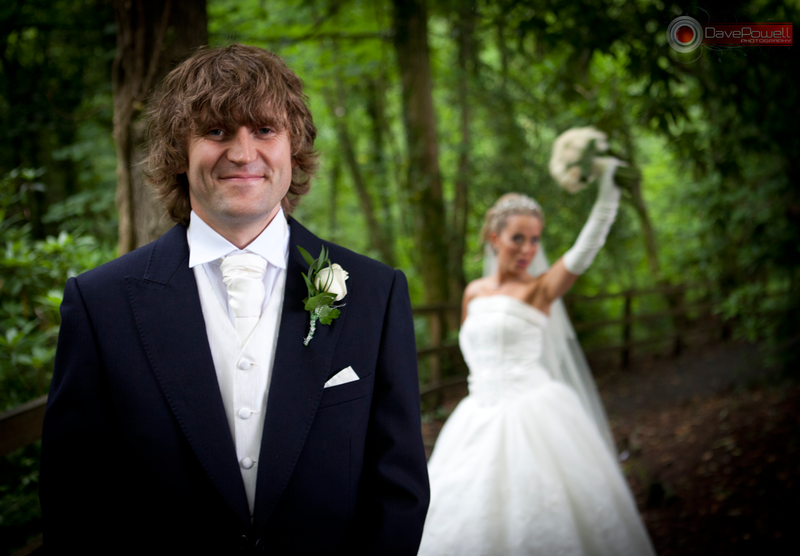 The aim is to get the bride and groom to relax and have fun. No-one wants their wedding album full of serious, moody photographs because I’m betting, their wedding day wasn’t serious and moody at all. One more funny one. I do have to admit that this one wasn’t my idea. Sam and John had seen the image in a wedding magazine and emailed me to see if I could re-create it. My couples often do this and I like the challenge of creating something new. It also adds to my arsenal of wedding photography ideas and that is never a bad thing. I made sure I focused on the bridesmaids and groomsmen then flicked the lens to Manual Focus. This ensured that the autofocus wouldn’t try and focus on Sam and John once they moved in for the kiss. The photograph made their album and I’ve been asked to re-create it a couple of times since. If you like this post and would like to share it, feel free to use the buttons below. I would be eternally grateful.